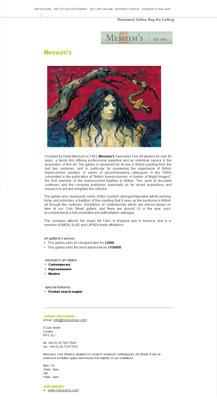 The buy-original-art.com galleries directory attracts a worldwide audience of art collectors, appreciators and professionals and is independently rated as one of the web’s most popular destinations to learn, explore and buy original art. With thousands of highly targeted unique visitors each day we can bring customers directly to you. The directory is committed to quality and inclusion is subject to our editors’ review and approval. Unlike many other web art listings, our aim is not to add the most art sites but to sort out the most suitable ones and bring our traffic directly to them. Your gallery is indexed and searchable by specialty, media, name and location. Your member gallery page will include your logo, inventory or exhibition image, detailed description of the gallery and exhibitors, gallery’s contacts and several direct links to the gallery’s website. If you are an online art dealer you can add dynamic descriptions of styles and media offered on your website, price range, payment options, delivery methods and other special services. We empower you to make sales - customers who visit your page at buy-original-art.com will contact you directly via email or phone, and we take no commissions. We enhance your web presence - our member galleries' pages independently get top ranking on google, yahoo and AOL and starting to receive hundreds of direct click troughs within few weeks after submission to the buy-original-art.com directory. **suggesting a gallery is free. Submission fee will be delivered through Paypal subsequent to our editors' approval. if you own a top-level online art gallery, fine art gallery or an artist website click here and have it listed today with buy-original-art.com.